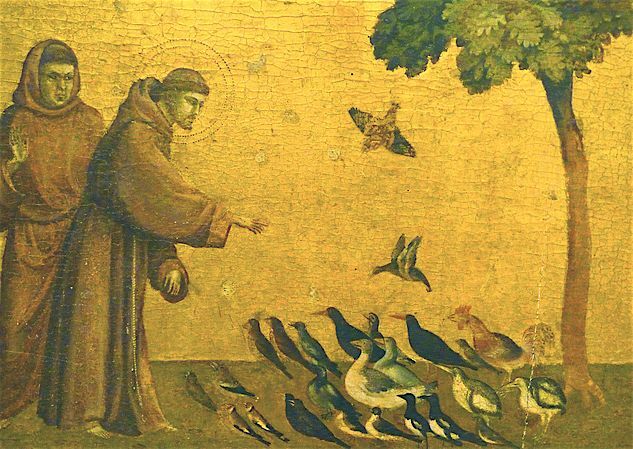 PURPOSE: There is a long history of applying nonviolence (ahimsa) to the natural world: including Jainism, Buddhism, Franciscan spirituality, the modern deep ecology and ecosophy movements, and much else. Gandhi’s insight was to link Hindu oneness of life with Christian active love. 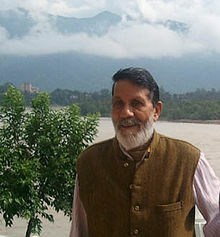 His synthesis became ‘the active practice of nonviolence (satyagraha) in defence of life’, including the Natural World, and forms the basis for a discussion about the application of nonviolent resistance strategies to climate change, environmentalism, and the preservation of all forms of life on planet earth. What is this history? What are the implications of Gandhi’s synthesis? What are the possible strategies of resistance? We hope to address these issues in our Natural World section. The Natural World page is edited by Michael Sawyer. Our world is experiencing an ever-growing ecological crisis, which makes it necessary for humanity to reshape the way it is dealing with the planet. 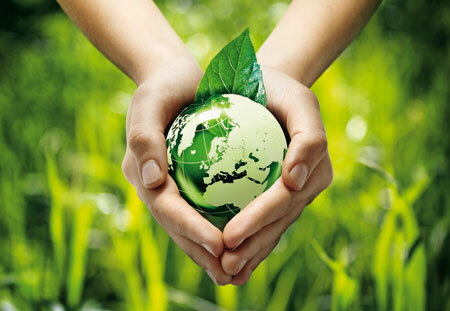 Grave challenges for the future of humanity and the earth as a whole have emerged as a result of ecological and economic conduct over the past few centuries. According to some, the environmental crisis is intertwined with other crises (financial, social, political), which has led both scholars and activists to call for a fundamental change in the global paradigm. Where socio-political change is concerned, part of this paradigm change has been attempted through nonviolence. Pioneered as a method in the early 20th century by Mohandas Gandhi for addressing injustice, it has since been taken up by many more individuals and organisations around the world. Nonviolence practices and notions can also be found in certain streams of ecology. One central element in the method of nonviolence is ahimsa, ‘the absence of the intention to do harm.’ In this article I will explore both ahimsa and radical ecology, to both explain the role and significance of ahimsa in nonviolence and to see if and how the two notions can clarify and supplement each other. 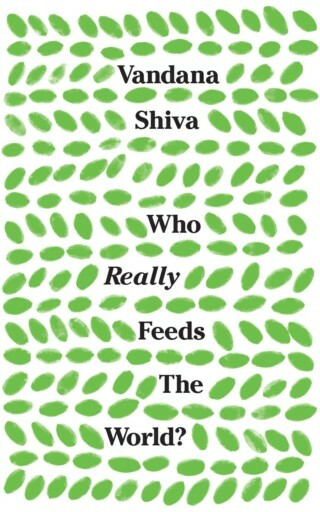 Book Review: Vandana Shiva’s Who Really Feeds the World? Humanity will always have a few basic needs: clothing, shelter, food. In the early 1900s, Gandhi saw clearly how imperialist colonialism had hijacked India’s sovereignty along with its ability to clothe itself, and he inspired a nation to reclaim the right to spin its own cloth. The people embraced homespun khadi and the spinning wheel, not only for their practical utility in reestablishing the independent foundation for a local economy, but for their deep symbolic significance in resisting the oppressive forces of racism, sexism, and classism perpetuated by imperialistic greed. 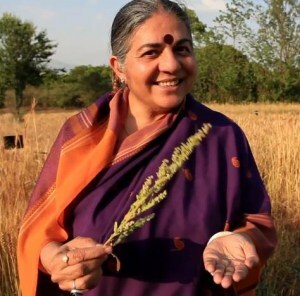 In her book Who Really Feeds the World (London: Zed Books, 2016) Vandana Shiva describes how India is again reclaiming another of humanity’s elemental needs from equally rapacious forces: the ability and right for a community to feed itself. This time, the symbol of communal empowerment is the humble seed, and Shiva’s Navdanya movement urges all Indians – and all peoples – to plant diverse seeds on every plot and balcony as a way to resist and reclaim food and seed sovereignty. 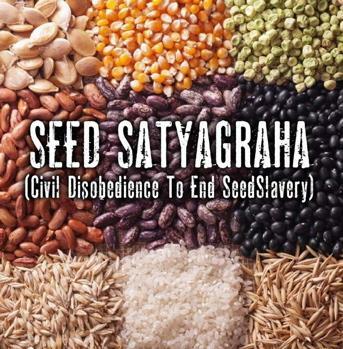 Navdanya follows in the footsteps of Gandhi, employing Seed Satyagraha, or non-cooperation, to resist laws and policies that would allow large, trans-national corporations not only to convert local farms to industrialized, chemical-intensive practices, but also to outlaw ancient practices such as seed saving and sharing. David Barsamian: In the wake of the attacks on Mumbai in late November 2008, there was a piece in the (London) Sunday Express, “The Irony Gandhism Presents in Today’s Terror-Infested India.” The writer said, “It is time the government became doubly stern about its steps to combat terrorism. India may be the land of Mahatma Gandhi, but today’s situation warrants crude and cunning ways to counter extremism. That alone can ensure peace, harmony, and joy in the country.” Would you share your thoughts on this? Vandana Shiva: Unfortunately, “crude” means of dealing with violence and terror just breed more violence and terror. As we saw after 9/11, the war on terror has created more terrorists. I think anyone who says that Gandhi is irrelevant in today’s world doesn’t understand either terrorism, its roots, or Gandhi. Suicide bombers don’t get created out of the blue; they are created as a result of decisions, systems, and processes. It’s very much like weeds in a field. One way to control weeds is by spraying Round-Up pesticides, but then you get Round-Up-resistant weeds, which are even stronger than the original weeds. That’s what is happening with terrorism. Acres U.S.A.: How should we approach the story of Indian agriculture? Vandana Shiva: The first thing you need to remember is that India is a land which has been farmed for 10,000 years continuously and sustains more than a billion people on its agriculture. India is the land where the British were the rulers, and in 1891 they sent John Augustus Voelcker to make a survey. He wrote a report on Indian agriculture that was published two years later. He said he could find more ways that Indian farmers could advise Great Britain about how to improve its farming than ways the British could advise India. He wrote that Indian agriculture was not backward, and that in many areas there was little or no room for improvement. Then the imperial British government sent Albert Howard to India in 1905. He arrived to find the fields were fertile. He found no pests damaging the crops, and he decided to make the study of peasant agriculture his profession. The agricultural testament that resulted from his studies became the basis of the organic movement worldwide — the Soil Association in the U.K., Rodale in the United States, all of them came out of Howard’s information, and Howard’s inspiration was ancient Indian agriculture. He so clearly distinguished between, as he said, the agriculture of the Occidental world and the agriculture of the Orient. As I follow the regular, dire reports on global warming, I recall my visit two years ago (2007) into the foothills of the Himalayas near the border of China and Nepal, north of Dehradun in India. There I met Dr. Vandana Shiva, a leading anti-globalization and environmental activist, a brilliant, engaging scientist and Gandhian activist. She has taken up a formidable challenge, a nonviolent civil resistance campaign to resist globalization and protect farmers, not to mention the earth itself. Her strategy is to harvest every endangered seed and indigenous plant, restore the soil to its original richness, and save the seeds from corporate patent theft by creating “seed banks.” She is a modern-day Noah, gathering for the future the plants of the world. I toured Navdanya Farm, her farming commune and laboratory for biodiversity conservation and farmers’ rights, then moved on to see Bija Vidyapeeth (Earth University), a college she founded to teach sustainable living and global alternatives. There one learns new ways to cook, garden, compost, farm, organize politically, and practice yoga. 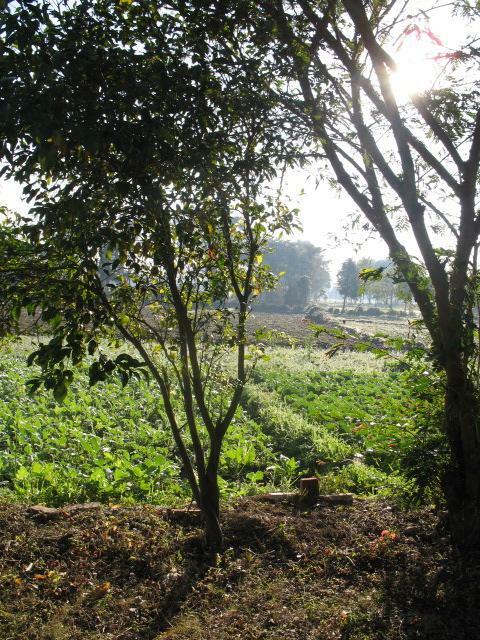 The fields of Navdanya Farm teem with every imaginable crop and spice. Over 600 species of plants grow there, along with 250 types of rice. White egrets pace gracefully among the fields. Here agricultural scientists have also embraced Gandhian nonviolent resistance methods to protect the earth. The thinking person, as Walter Benjamin had occasion to remark, appears to experience crisis at every juncture of her or his life. How can this not be so if one were to experience the pain of someone else as one’s own? How can this not be so when, amidst growing stockpiles of food in many countries, millions continue to suffer from malnutrition, and the lengthening shadows of poverty give lie to the pious promises and pompous proclamations by the world’s leaders over the last several decades that humanity is determined to achieve victory in its quest to eradicate poverty? With war, violence, disease, and the myriad manifestations of racism, sexism, and other forms of discrimination which man’s ingenuity has wrought all around us, how might a person not be experiencing crisis? One foundation after another—whether it be named after Bill and Melinda Gates, the Clintons, Ford, Rockefeller, or other tycoons—has claimed to have helped “millions” of people around the world, but the crises appear to be multiplying. We mourn the loss of our Natural World editor Suzanne Duarte, who died suddenly of natural causes on December 5, 2015 at her home in Boulder, Colorado. 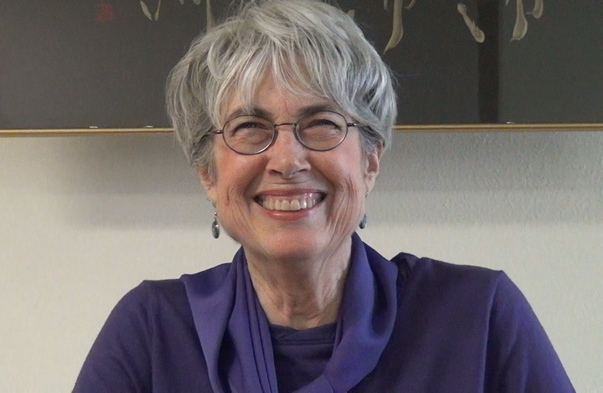 Originally from California, Suzanne lived for most of her life in the western part of the country where she first came to know and love the wild places of the Earth – the Redwood Forests of northern California, Yosemite National Park, the Colorado Rockies and the Sangre de Cristo Mountains of southern Colorado. They were for her the true mentors teaching us about our interconnectedness with nature, which she later recognized in the deep ecology theory of Arne Naess. Nature is stabilized by order, and humans along with all other natural phenomena exist within nature. Attempting to force one’s own path is arrogant, futile and self-destructive. Everything depends on others for survival and nothing really exists apart from everything else. Therefore, there is no permanent self or entity independent of others. Not only are we interdependent, but we are an interrelated whole. 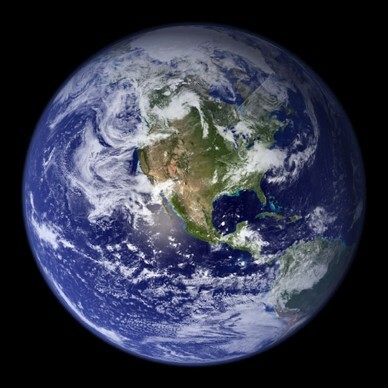 As trees, rocks, clouds, insects, humans and animals, we are all equals and part of our universe. Dharmagaians (1) are people who seek and speak the truth, cherish and protect the Earth, and act responsibly for the benefit of future generations of all sentient beings. They are not afraid to engage with the truth, the facts of our time, no matter how difficult and painful. In fact, many Dharmagaians have been doing so in writing and teaching for decades. Dharmagaians are also not afraid to allow themselves to feel the suffering of beings living now and those yet to be born, who will inherit a depleted planet. One Dharmagaian ally, the cosmologist Brian Swimme, tells us that we are living in the most destructive moment in 65 million years. The Earth is withering under the onslaught of humans: our consumption of the biological and mineral endowment of the planet, and our pollution and waste. Species are going extinct at an unprecedented and increasing rate. Resources are declining and shortages are beginning to manifest in the parts of the world that are not already suffering them. Mahatma Gandhi’s concept of self-governance (swaraj) aimed to create an egalitarian society. To achieve it, a committed group of people established Dasholi Gram Swarajya Mandal (Society for Village Self-Rule; DGSM) at Gopeshwar, northern India, in 1964. Since the objective was to develop a self sustaining nonviolent society, training was offered in village industries, agriculture, horticulture, animal husbandry, harvesting forest produce, utilizing mineral resources, employment in various construction activities, educating and awakening people for forest protection, husbanding of natural resources, etc. Gradually, DGSM become a symbol of village self-reliance. However, everything changed in 1970 when a massive flood hit the Alaknanda river basin, devastating the normal life and destroying the property. The flood was unprecedented in the history of the region, and was described by the government as a natural calamity. But the relief workers of DGSM refused to accept this, as they had witnessed the destruction of the forests between 1950-1970 in the watersheds from where the flood originated. While undertaking the relief operation in the flood-affected watersheds, DGSM volunteers concluded that the flood was more man-made than claimed.